Although they make for fantastic garden decor… I’m not totally convinced that butterflies actually use butterfly houses? I know they use feeders, especially those that imitate nature via “wicks”. The wicks absorb the nectar and butterflies actually feed from them, simulating the same process as getting nectar from flowers. They will also eat over-ripened fruit, you can view the video below for proof on that one! Oranges, bananas, strawberries and melons seem to work well. If feeding butterflies nectar, it’s always best to add a sponge (preferably a new one) to the dish. The sponge absorbs the nectar and again, acts as a wick. This is strongly recommended as butterflies will not drink from an open source. They will also use shallow salt baths, or “puddlers”. Gardening plays a major role in attracting the winged wonders too. Both host and nectar-producing plants are needed for their attraction. Another item that butterflies (and hummingbirds) adore are leaf misters. The activity in a garden around a mister in summer is truly amazing. And as far as those butterfly houses? Some say if you put a small branch or twig inside they will use them for shelter, but honestly, I’ve never tried it. The butterfly houses above are handcrafted of solid cypress. Both durable and attractive in any landscape, they’re meant to last for many years. They include classic copper accents and their own mounting pole too. Butterflies’ migration spans thousands of miles, and although they can survive cold weather, these winged wonders will die if they get wet when temperatures drop. Providing butterfly houses may just help the Monarch’s population. Although they don’t hibernate during the warm summer season, creating a butterfly-friendly habitat will help them flourish and thrive. Because butterflies will not drink from an open water source, things like leaf misters and puddlers in your yard are most helpful for a fresh water source during extreme heat. Having both the host plant for their metamorphosis and nectar plants for food will encourage population growth too. Check out this interesting video from Defenders of Wildlife and Discovery on the Monarch Butterfly. Although I can’t say for sure that butterflies actually use butterfly houses, there sure are some beauties to adorn your garden. 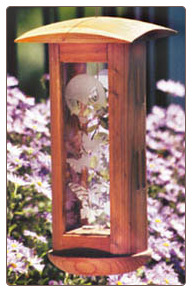 This pole-mounted butterfly house features rich redwood with hand-etched glass panels. I can say with certainty that butterflies absolutely adore the gentle spray from leaf misters! We use two during the summer months and see daily activity throughout the season. Over ripened fruit is also a butterfly favorite. Bananas, melon, pears and oranges that are just a tad past their prime are a sweet treat for these winged wonders. The fruit also attracts fruit flies and these provide butterflies with additional protein. Molded fruit is not advised, so it must be monitored to assure this doesn’t happen. Set fruit out on a plate, on a deck or porch rail, even an up-turned pot will work. But the butterfly garden must be part of the equation too. 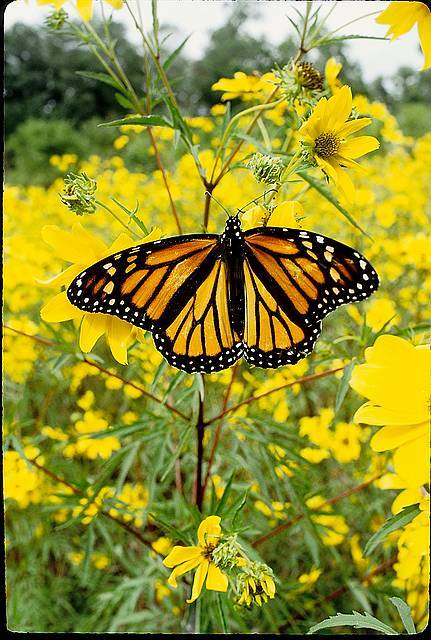 Native plants to provide nectar are necessary in creating a butterfly garden. Wild Columbine, Rose Verbena, Button Bush, Blue Lobelia, Cardinal Flower, Asters, and Milkweed are a few favorites. Besides nectar plants, host plants are needed for the metamorphosis from caterpillar to butterfly. These plants will likely be “munched” in the process, but they’ll come back again next year, and you’re providing critical butterfly habitat by letting them go. Some of the more popular host plants include Parsley, Dill, Fennel, Carrot and Milkweed. Trees include Wild Cherry, Willow, Plum and Poplar. Adding a place to “warm in the sun” is also quite attractive to butterflies. You can easily arrange heat-absorbing rocks in a sunny area, add some sand and salts and keep the area moist to further entice butterflies. It’s recommended to first line the area with plastic to keep the salts from leaking into the soil. Definitely stop using any pesticides, chemicals or fertilizers in the area as well, most people tend to overlook this important factor when creating a butterfly habitat. So… although I can’t say for sure that butterflies use butterfly houses… these are some good ideas on creating an enticing butterfly habitat at your home. Last week in Atlanta, the Merchandise Mart hosted its annual gift show, with a whole floor dedicated to backyard birding. Spending a whole day there just wasn’t enough, I felt like a kid in a candy store and wanted everything! Unfortunately, that’s far from possible, so the search was narrowed to very unique birding products, namely one, butterfly houses. Many of the standards were there, in cedar construction from small to large. 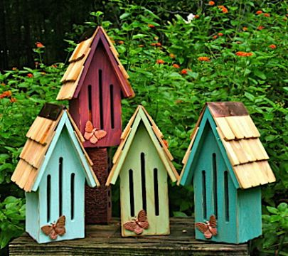 A few recycled plastic (or poly lumber) butterfly houses were shown in some fab colors. This one caught my eye however, likely because of the mod curved entrances. The copper accents were nice too, so I inquired. Upon learning these butterfly houses are hand crafted in solid cypress, and included the tall mounting poll, I was pretty much hooked. At home I don’t have a butterfly house, but last summer there were tons of butterflies. Planting the host plant (milkweed) helped, but the leaf misters are what kept them around daily. Butterflies absolutely love the gentle spray from a leaf mister, whether they really use these houses or not…you can attract them with mist! By the way…Hummingbirds and others really love that mist during summer’s sweltering temperatures too! Are Butterfly Houses for Aesthetics or Shelter? Surprising to me, we had a wonderful butterfly season in the Atlanta area this year. I can’t recall a summer where so many had populated my yard. I know the two leaf misters were a huge attraction for them, along with some newly planted milkweed. Other flowers like lantana and abelia shrubs saw lots of action from these winged jewels too. There is no butterfly house in the yard, and I’ve always wondered whether or not butterflies really use them? 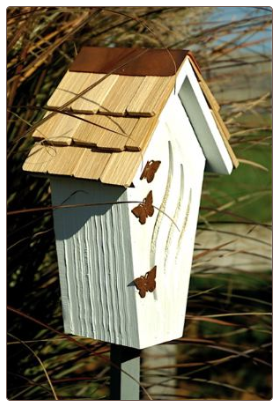 Some butterfly houses are like detailed works of art for the garden, they enhance and add a nice focal point to the area. The butterfly house shown here is constructed of durable red cedar, and the etched glass panels that catch light beautifully. It’s available as a hanging, or post mount model too. But back to the question if butterflies really use butterfly houses or not? They sure make some very pretty ones, whimsical and artsy types to use in the garden for accents or focal points. But do butterflies really use butterfly houses? I can’t answer that question, but never have I actually seen it happen. Protection from the elements and from predators are the reasoning behind it, and it makes perfect sense, but…who really knows? I can say there are tons of butterflies in my yard now, hovering around the usual lantana and butterfly bush. The mature abelia with its tiny pink flowers seems to be a favorite as well. The big attraction for the flying jewels has got to be the leaf misters. There are two of them in the yard, one is simply staked in the ground with an old plant stake, and the other sits off the front porch attached to a deck bracket. Our butterflies absolutely love the gentle mist they produce. Flying through them all day in the extreme Georgia heat must be a relief for them. Lots of Swallowtails, we’re even seeing more Monarchs this year. And by the way, how did they get their name “butterflies”? Butter doesn’t fly – so what gives? I think someone messed up and should have called them flutterflies! Time-lapse close up of Monarch caterpillar pupating and later the butterfly braking out of its chrysalis. Notice how the wings expand as the belly fluids are pumped into them. Save a Monarch, grow a Milkweed! Add a butterfly house for shelter from weather and predators too. They’ve earned the nickname “flying flowers” as the grace and beauty of butterflies in the garden is marvelous. If you enjoy seeing butterflies, there are steps you can take for maximum attraction next spring. Creating Habitat that butterflies find alluring is actually pretty simple. A great article on “How to Make a Butterfly Garden” from the University of Kentucky’s Entomology Department, can be found here: http://www.ca.uky.edu/ENTOMOLOGY/entfacts/ef006.asp Copy and paste this address in your browser’s address bar. Food: Nectar is always an option, but butterflies adore over-ripe fruit. Oranges, bananas, melons, and grapes are just a few of the fruits the enjoy. Place fruit on a staked feeder dish, on the porch railing, or anywhere near the flower garden, raised where it may be seen. Be sure to remove if molded. 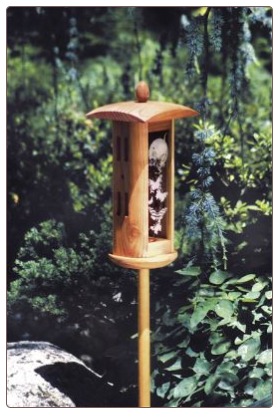 Shelter: By providing butterfly houses, you’re offering shelter from both the elements and predators. Giving butterflies a sfe haven to rest helps attract them to your yard.